Hanoi (VNA) – Education and training are a bright spot in the defence relation between Vietnam and India, said Deputy Chief of the General Staff of the Vietnam People’s Army (VPA) Pham Hong Huong. 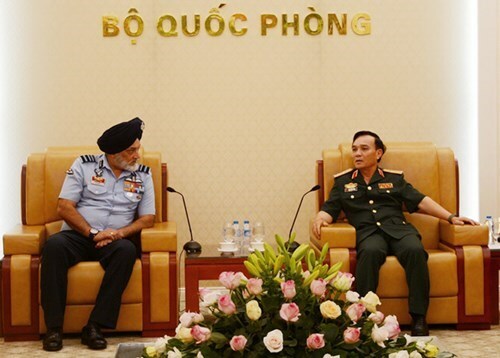 Lieutenant General Huong made the remark at a reception in Hanoi on August 28 for Lieutenant General Jasjit Singh Kler, Commandant of India’s National Defence Academy. He added that the bilateral ties have also been tightened in the fields of delegation exchanges, naval cooperation and defence industry. The Vietnamese army always treasures and bears in mind the support of India’s army and people for Vietnam’s past struggle for national liberation and current nation building and development, the officer said. Jasjit Singh Kler informed the host of the performance of Vietnamese officers under training at India’s National Defence Academy.